Every professional photographer had to start out in the business somewhere, and we were all new photographers at some point, but what are you supposed to do with your marketing efforts that will effectively reach your ideal clients when no one knows who you are yet? So far in this series, I’ve talked a lot about the many challenges and frustrations photographers face when they’re new to the business. Sadly, for a large number of photographers, those problems hang around for a long time, and they’ve never really managed to get things off the ground for one reason or another. Of all the difficulties you have to deal with in your business, finding new clients has to be right there at the top of the list, alongside things like worrying about how to reach the people you want to work with through your marketing. Before you can do that, though, before you publish a single marketing piece aimed at attracting people, there’s a certain amount of foundation work that needs to be done. Yes, I know some of it can be tedious, and it’s never as exciting as creating photographs or artwork with Photoshop, but the truth is your business really can’t survive in the long term without these things being taken care of. For example, in part one, we looked at ways to start your business on the right footing so that you’ll have solid ground upon which to build later on. Part two tackled the idea of creating and building an online marketing empire, and how to go about it the right way so that you have an effective platform from which to communicate with your target market. A steady and reliable platform is going to strengthen your message, whereas no one wants to find themselves trying to broadcast from a shaky stage. In part three we spent some time to identify the reasons why most marketing efforts seem to fail for new photographers. Those all boiled down to the simple fact that there’s really no sense in developing strategies and tactics going forward without understanding the fundamental principles of who and what you’re dealing with because marketing is not easy or as simple as a lot of people make it out to be. But today, this is where all that groundwork comes together and you can actually start doing some real marketing! With that goal in mind, we’ll look at three very solid marketing strategies you can start using today to market yourself to your ideal clients. If you’ve invested the time to lay the groundwork we talked about in the previous installments these should work very well, regardless of whether you started your business yesterday or 5 years ago, because they’re built on solid and proven marketing principles, not “magic bullets” or the latest flavor-of-the-month fancy system. The first strategy you should work on, before doing anything else, is creating useful cornerstone content on your website that can act as a centralized resource center for your ideal clients. This type of content allows people to discover those fundamental things that all of your customers should really know before deciding to hire you, or any photographer for that matter. To be clear, this is not content about you or your photography. That kind of information is far more suitable for your service pages, your about page, and your frequently-asked questions pages. Most photographers, in fact, seem to stop at this point. They provide very little else on their websites other than some basic information about who they are and what they do, which creates a very superficial-looking website with no charisma, personality, or presence. Obviously, this gives any photographer who is willing to take it a step further a huge advantage in the marketing game. Cornerstone content adds to the basics of your website by addressing some of the more detailed issues and challenges your customers might have in connection with the type of photography you offer. While your FAQ pages might answer short questions such as “what does a typical portrait session look like?” or “what are the payment terms and guarantee?”, some of your cornerstone content might go into detail about how to choose the right combination of outfits for a family, depending on the season, make-up tips for brides, or how to get your whole family emotionally invested in having a family portrait created. For example, if you’re a prospective bride, there are lots of issues around planning the perfect wedding or dealing with the logistics of the wedding day that a photographer can help you learn how to deal with by giving information that will help solve many of the problems you may not yet even realize you have. Can you imagine how thrilled that young lady is going to be if you give her great solutions to all those things that are causing stress in her wedding planning? How likely do you think she is to remember you when it’s time to hire a photographer, based on that kind of help? 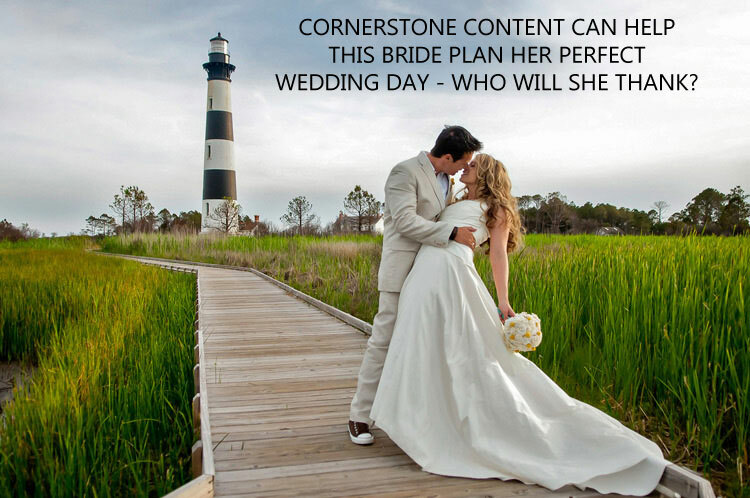 In short, cornerstone content turns your website from a basic site that looks just the same as every other photographer’s website out there into a valuable resource center for your ideal clients, which they can use to help them truly understand the value you have to offer as well as your dedication and expertise. The great thing is, if you get this part right, it changes everything! It’s no longer just about making great photos at the best price, but about customers who now have a deeper relationship with you because you took the time to help them out with things other photographers just don’t bother with. All of a sudden you become a business owner who cares about the people you serve, while everyone else is “just a photographer”. If you can see the massive difference that can make to your future success, then don’t you think it makes perfect sense to actively invest in strategies like these? Of course, there are lots of ways you can do this, and your cornerstone content can be made up of text, audio, video, photographs, and infographics. But, ideally, you’ll want a good mixture of media on each of your cornerstone content pages. This will make your content feel rich and detailed, as well as keeping your visitors interested. Your cornerstone content should also be substantial in nature—there’s really no advantage at all in cutting corners here. In fact, this is one of the requirements that seems to stop a lot of those other photographers from producing this kind of material for their websites because it takes a certain amount of thought, time, and effort to put it all together. But it’s all worth it when you start to hear from prospects who are more interested in talking with you about what they want you to do for them, instead of being totally focused on the price and how many photos they get compared to the photographer down the street! Before we move on to the next topic, a quick word about organizing your cornerstone content on the website. What you’re essentially creating here is a resource library, or a hub within your website, around which the rest of your content revolves. It’s an information center, and a good way to organize it is to follow the library model. In your library, you’ll have various content sections. For example, weddings, portraits, commercial, fine art—whatever it is that you do as a photographer. In each of those sections, you’ll have a main index page where people can access the different pages of content for each section. Each of those pages will then link back to the appropriate index page. As an example, let’s suppose you have five resource articles for prospective brides. The main index page will have five links on it—one for each article, but each of those articles will have one link that points back to the main index page. This creates a hub where the index page has at least five links coming in to it, and each of the sub-pages has one link (the link from the index page). 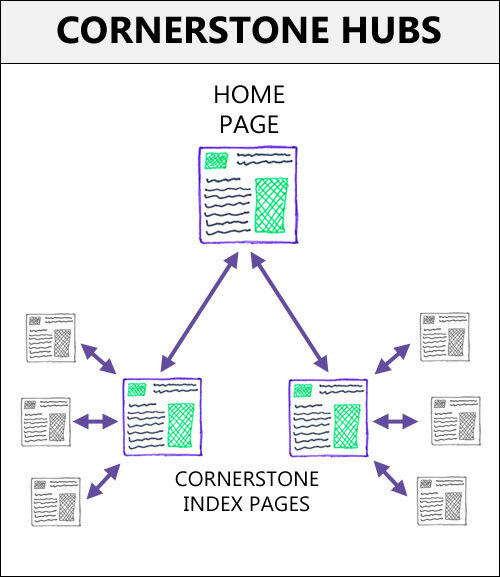 The concept of cornerstone content hubs within your website—the index pages for each hub will usually attract more SEO value because they have more incoming links. From an organizational standpoint, this helps the reader to easily find their way around the content and keeps them engaged with it. From a search engine optimization perspective, it means you can focus the majority of your SEO efforts on the index page, since that’s the one that Google will see as the most important because it has more incoming links than the sub-pages. Obviously, whenever you mention one of your cornerstone content topics in a blog post or on another page of your site, you can direct visitors to the appropriate index page for that content with a hyperlink, which will also enhance the relative importance of that page. Finally, make sure that each of your cornerstone resource pages has a call to action on it somewhere—usually at the end. The most effective call to action at this stage of your marketing is to encourage your visitors to sign up for your mailing list, which will then help move them further along your marketing funnel and closer to your goal of working with them. The next strategy I want to talk about here is using landing pages to convert the right prospects and visitors into leads you can then have a conversation with to turn them into paying clients. In fact, this is really part one of a two-part strategy, as you’ll see. But what do we mean by the term “landing page”? There’s a lot of confusion out there about what a landing page really is, so let’s clear that up so that we’re all on the same page (no pun intended—well, okay, maybe a small one). The term “landing page” originates from the world of Internet marketing, and paid advertising specifically, to describe the destination page of an ad that targets a specific keyword or set of keywords. It can also be used to describe a page that’s optimized very tightly for SEO to attract visitors for a specific keyword, and with a definite goal in mind. Generally speaking, landing pages typically have a main purpose in mind, which is designed to get a return on investment (otherwise referred to as “ROI” for short) on the time or money you invested in promoting the page. That purpose is usually either a sale or an opt-in to a mailing list of some kind where a sale can happen at a later point. With that definition in mind, this means your regular service pages or even your cornerstone content pages don’t really qualify as landing pages simply because someone can land on them—there’s a bit more to it than that, as you’ll see. 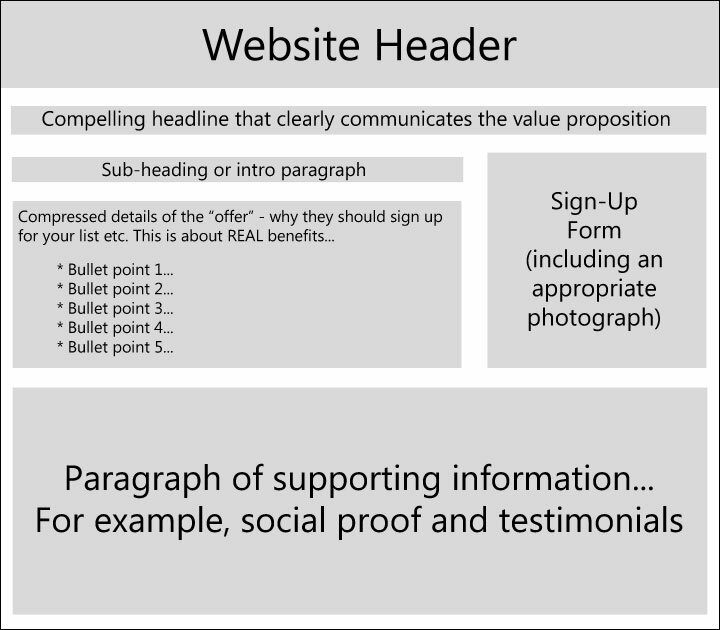 An example of a typical landing page structure, although there are many variations, and you must still test to find what works for you and your audience. So what makes a good landing page? Unfortunately, despite the many articles on this topic around the Internet trying to tell you otherwise, there really isn’t a secret formula to creating the perfect landing page that works every time. As the folks at Marketing Sherpa often say, “there are no expert marketers, only experienced marketers”, and getting the very best results from any given landing page is a case of constant trial and error through a system of testing to find out what works best for that page and its unique audience. That said, there are some elements common to most well-performing landing pages, as well as things that good landing pages don’t have on them. In the latter case, it’s what you cut from the page that makes the difference. Those things are obviously much harder for the casual marketer to spot, since they’re absent. So here’s a quick list of qualities you might want to check on when you’re creating your own landing pages. Images should only be used on the landing page that support or enhance the marketing message you’re trying to get across or for social proof. Slideshows, for example, should be avoided at all costs on a landing page unless the images in the slideshow are purposely designed to clearly communicate something that supports the text on the page. On the other hand, videos can be very useful on a landing page, if they’re short and to the point, although it’s still worth repeating the message of the video in the text because not everyone prefers to watch video over reading the words on a page. In essence, anything that can distract the visitor or potentially send them away from your landing page should be avoided. Many marketers even take this to the extreme of removing the normal website header and navigation menu, but I personally feel this might be taking things a little too far. As long as the main content section of the landing page is clear and uncluttered, and the call to action is obvious, then that’s a great place to start. Of course, you can create all the landing pages you want to, but none of that is going to help all that much unless you have some people to land on them. That’s why I mentioned earlier on that landing pages is really just part one of a two-part strategy. In other words, to use the popular Internet vernacular, you need to send traffic to those pages. Personally, I detest the word “traffic” almost as much as I hate being stuck in it on the road, and I much prefer the more personal-sounding term “visitors”. Of those, the first one is painfully slow unless you’re really good at SEO and already have great search engine rankings to begin with, but at least the only cost to you is time. The second option—using paid advertising—is the one I want to talk about here in a bit more detail, as that’s the method most likely to get you the best results in the least amount of time. Many photographers seem to have a natural hatred for paid advertising for some reason, and I really hope you don’t fall into that category because there’s no business reason I can imagine for just sitting around and waiting for visitors to find their way to your website and landing pages. If you’re serious about the success of your business (and I can only assume you are if you’re still here), then you’ll appreciate what I mean when I say that ads are an investment in your future success. That’s why marketing performance is called a “return on investment”, and not a “return on expenses”. I guess that really answers the first question I usually hear on this topic, which is why do we need to use ads? The answer to that one is quite simple—to acquire a certain number of visitors for a website landing page in order to convert some of those into leads or paying clients. Which Ad platform To Use? The second question is usually which ad platform should we use? Google AdWords or Facebook ads? The answer to that depends on who it is you want to reach with your ads. If your landing page targets people who may not be very active on Facebook, for example, then you should probably consider using Google AdWords to reach a more general audience. On the other hand, if the people you’re looking for already frequent Facebook and you can easily identify them as a demographic, then Facebook ads are going to be your best bet all round. One small advantage with Facebook ads is that you can create separate ads in a campaign for ads shown on mobile devices or desktop users. Mobile ads tend to be a little less expensive so that helps to keep the overall cost down. Cost-wise, Google AdWords tends to be a bit more expensive than Facebook ads, so that might also be a deciding factor for you if you’re on a relatively small advertising budget. Personally, I think that Facebook advertising is going to be the better alternative for wedding and portrait photographers, whereas Google AdWords, or even LinkedIn ads actually, might be the best fit for commercial photographers, but you’ll have to decide which one is the best for your own business goals. Where Should You Send Ad Clicks? A common mistake many people make with online ads is sending the ad clicks to a generic page on their website, usually the home page, which can be a huge waste of time and money because those pages are not designed specifically to cater to ad traffic and are not fully optimized for high conversion. Since we’re talking about ads here in the context of being the second part of a two-part strategy, where landing pages are the first part, it should come as no surprise that I recommend your landing pages as the destination for your ads. 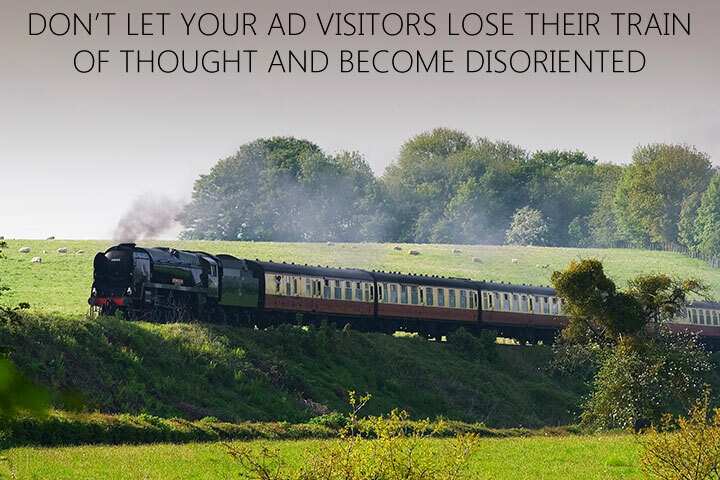 Don’t let your ad visitors lose their train of thought and become disoriented when they arrive on your website. One thing you might want to consider here, though, is the idea of “continuing the thread” or maintaining the train of thought of the user as they look at your ad. Let me explain what I mean by that exactly. If you take a look at your landing page from a very general perspective, you’ll notice that it has a certain look and feel in its appearance and, of course, you have the main headline. When you design your ad, you should do whatever you can to echo those things in the ad headline and copy, as well as in the associated image, if there is one. When someone clicks on the ad, it will then appear as seamless as you can make it, with the theme of your ad carrying over to the landing page, rather than causing a disconnect through the use of different colors, headlines, or images that may make people wonder if they’re actually in the right place. If you target your ad to the right people—those who are most likely to fit the model of your ideal client—you should see a reasonably high click-through rate and, hopefully, conversion on the landing page. From there, it’s a case of monitoring the conversion rate of your landing page, the click-through rate of the ad, and then working on one of those at a time to maximize them, starting with the landing page first, since that’s the point closest to the result of lead-generation or a sale. The great thing about these is that hardly any photographers are using them, or at least doing them well, which puts you in the perfect position to take advantage of that to put your business in the forefront of everyone’s minds in your local community.